This Demonstration displays parametric Lissajous figures from the projected coordinate components of two circles. You can vary the frequencies of the points moving around the two circles and the phase shift and radius of the top circle. Lissajous curves are formally defined as parametric curves in which the and components are sine functions. This family of curves is seen in physical waveforms such as electromagnetic waves and mechanical oscillations. 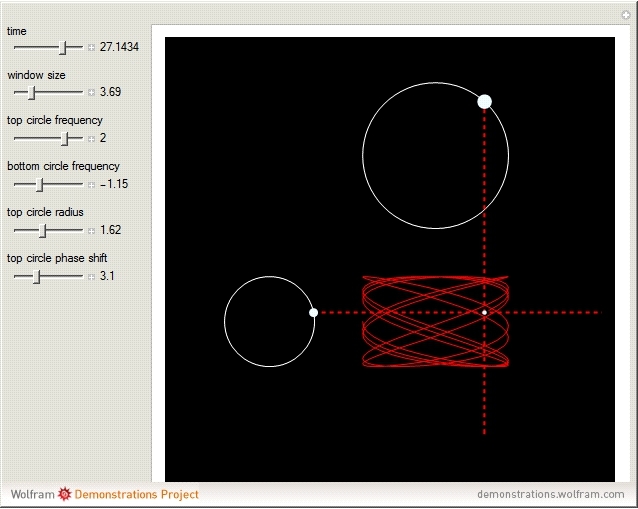 "Lissajous Figures from Projections of Points on Circles"